Kirk Morrison interviews the mayors of Seattle and Denver. It’s has turned into a tradition of sorts. The mayors from the cities of each Super Bowl team like to place a wager on the outcome of the game. Why should this year be any different? Seattle mayor Ed Murray and Denver mayor Michael Hancock sat down with Kirk Morrison to place their bets on Sunday’s game between the Seahawks and Broncos. So, what do they have on the line? Find out below. But that’s not all. FOX’s own Coy Wire discusses the origin of "Beast Mode" and what it was like playing with Marshawn Lynch in Buffalo. Who doesn’t love Jennifer Garner? We definitely do. The actress stops by Radio Row to talk about her new movie "Draft Day" and her love for the Red Sox. The Wayans family is arguably America’s first family of comedy. 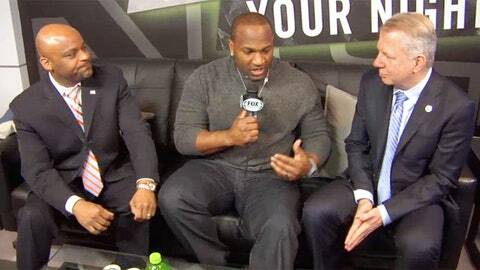 Well, Marlon hung out with Kirk Morrison in the green room for a couple laughs and predictions. Packers receiver Randall Cobb isn’t all about football. In fact, the talented athlete just made his broadway debut in Rock of Ages recently. He tells Lauro Okmin all about it on Radio Row. New York Giants safety Antrel Rolle loves art. So who better to discuss his passion with than Super Bowl artist Charles Fazzino? Check it out.